Hot air is generated by wood/ Briquettes. The material is conveyed by the screw at feeding point. The material is spread by lifters in a horizontal shell. Hot air is sucked by the fan through the shell in the presence of the wet material. 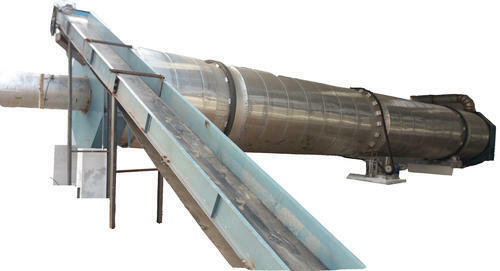 With the rotation of the cylinder, the material flow down to the lower end with the effect of gravity and discharge after drying, at endpoint material comes out with the help of cyclone & Rotary valve with required moisture. Evaporated moisture goes into the atmosphere by sucking fan.